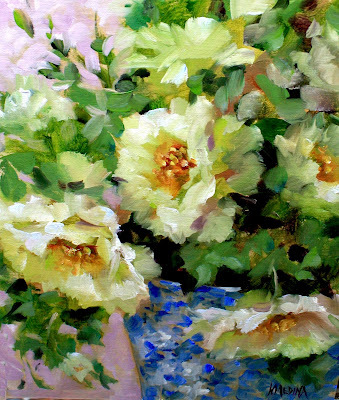 Trick of the Light White Roses is drying on the easel, named for a book by one of my favorite authors, Louise Penny. Trick of the Light is her newest book in her Detective Armand Gamache series. If you've never read her, you are so lucky because there are half a dozen books just waiting that you are going to love. Louise is a four time winner of the Agatha Award for best mystery. I do my "reading" on CD when I'm driving to and from work. It's the only spare time I've got. And I have to confess, I'm such a rabid fan, I even follow her on Facebook. No worries though, I haven't any nursing background and I've never been arrested for kidnapping or holding an author hostage before. Simply gorgeous Nancy! I love the light in this painting. You nailed it. Jo I appreciate that. They have certainly been a work in progress! Thank you Benny and Lily, did you see the new football commercial with a Frenchy in it? too cute! How do you make these roses so beautiful? We can smell their sweetness! What a gorgeous painting, Nancy! Truly beautiful. And now you've planted a seed in my ear for these books! Gorgeous painting Nancy, love this one. Thank you for telling us about this author, I've written her name down so I can download her book on audio. I listen to books all the time while I paint, it helps inspire me for some reason. The only problem is, you run out of ideas as to who to listen to next so, thanks for this recommendation. Good to know you will not be going all "Misery"on us. That really was an awesome movie. oh the brillance of the light shines straight through! i love the blue vase! it looks like a glass mosaic dancing in the light with the beautiful white flowers enjoying its glow!